Gareth Brown, along with his wife and new baby, live in a small rural community about 40 miles from Valdez, Alaska. Brown grew up in the snow and found his passion in playing and studying the myriad snowflakes that blanket the mountains in the winter. Sarah Carter, the Valdez Avalanche Center Director and a long-time forecaster and teacher, recruited Brown as an intern when she realized he wanted his life with snow to be more than a hobby. “Gareth inspires his community because he is always putting in ski tracks that others are able to follow because he chooses terrain that matches the conditions. Brown got his chance to focus on snow this year with a scholarship from the Erik Peterson memorial fund. A $250 scholarship supported his efforts to complete his American Avalanche Association bridge course from recreation to professional. 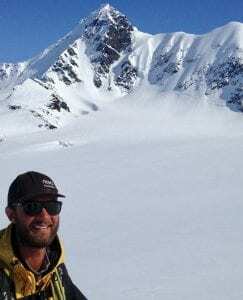 He has also spent the winter honing his craft under the expert guidance and mentorship from professional forecasters like Alaska Department of Transportation avalanche forecaster and practioner Pete Carter, and Valdez avalanche center forecaster Peter Biskind. “This scholarship means so much to me,” said Brown. “Having people support my efforts to be able to advance my career will ensure I am sustainable and have the opportunity to give back to my community. Brown sends his sincere thanks and appreciation to the Erik Peterson Memorial fund for supporting his efforts to become a fully certified avalanche forecast practioner.